NOVEMBER 24, 2012 — EVANSTON, ILL. — On Nov. 23, 1912, Northwestern’s popular fight song, “Go U! Northwestern!”, premiered at a game against Illinois and has been sung by generations of fans ever since. One hundred years later, the University celebrated the song’s centennial with a contest soliciting creative and unique renditions of the song from students, alumni and fans. After receiving numerous entries, a select panel of judges—director of athletic bands Dan Farris, WildPride spirit squad coordinator Pam Bonnevier and head football coach Pat Fitzgerald—chose the epic rendition submitted by the Boneheads, the trombone section of the Northwestern University Marching Band, as the contest winner. The Boneheads consist of students Andres Caneva, Motoki Mizoguchi, Michael Nowakowski, Adam Snyder, Phillip Smith, Ashley Doody, Tom Saxton, Michael Creatura, Neal Kfoury, Tim Perian, Megan Wines, Aaron Blow and Michael Fagan. NOVEMBER 11, 2012 — KALAMAZOO, MICH. — It was a frenzied scene as cases of drums, sousaphones, drum major podiums, and the flags of the Big Ten Conference were carried from Regenstein Hall of Music to four coach buses waiting on the Northwestern University campus in Evanston, Ill. The student staff of the Northwestern University "Wildcat" Marching Band used their best geometric skills to pack it all in along with scores of other instruments, uniforms, and luggage. Tomorrow, the band will support the Wildcat football team, who will challenge the University of Michigan Wolverines at noon (ET). November 2, 2012 — EVANSTON, ILL. — "It’s really been unreal. I’ve gotten to do so many different things with the marching band," Drum Major Michael San Gabino (Mu14) tells the Park Ridge Herald-Advocate, a newspaper in suburban Chicagoland. 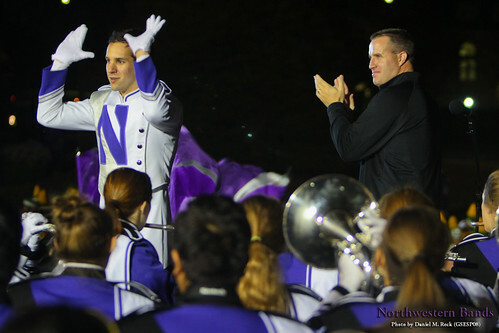 "San Gabino, one of two drum majors leading Northwestern University’s 'Wildcat' Marching Band this football season, got his start as a drum major with the Maine South High School Marching Band and as a performer across the school’s Fine Arts program, including orchestra, symphony band and choir.," writes Herald-Advocate reporter Jennifer Johnson in the article appearing today. October 28, 2012 — EVANSTON, ILL. — "It's almost time for basketball season to begin!" says Daniel J. Farris, director of althletic bands at Northwestern University. 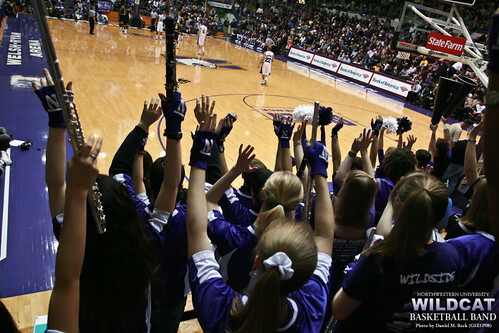 Student musicians from across the university are invited to an informational meeting tomorrow, Monday, October 29, at 5 p.m. in Regenstein Hall room 011, to learn about becoming members of the Northwestern University "Wildcat" Basketball Band. October 1, 2012 — EVANSTON, ILL. — This Saturday, children ages 3 to 8 are invited to "March with the Band." The first of the Kids Fare concert series performances will step off at 10:30 a.m. with the Northwestern University "Wildcat" Marching Band at Welsh-Ryan Arena on the Evanston campus. Kids fare provides "a comfortable and fun introduction to music through song, guided listening experiences, and creative movement," says Judy Moore, Northwestern University's fine and performing arts editor. "Young participants [will] experience the drum line, flag corps and Northwestern University’s Wildcat Marching Band, led by Daniel J. Farris," says Moore. "Children are invited to bring their favorite toy instrument and march with the band at the end of the program." Free parking is available this Saturday in the Ryan Field west lot on Ashland Avenue north of Central Street.